As of 2012, Frances Watkins has been trained in 'Short Term Adult Orthodontics'. 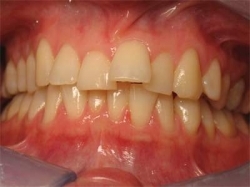 Short Term Orthodontics is the movement of the six anterior teeth in both arches if necessary, to treat crowding, crossed teeth, close mild spacing, and teeth that are in crossbite (trapped inside the bite). Mrs Watkins offers a 10 minute chat, Free of Charge, followed by a Full Consultation. 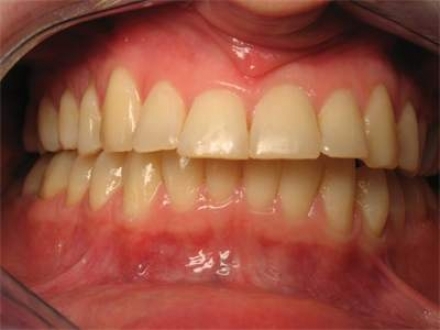 This appointment includes a full examination - including periodontal and teeth charting, full mouth xray will be needed, clinical photographs, and impressions for study models. The price of this appointment is then deducted from the final fee, if you decide to go ahead with treatment. The process will take between 6-9 monthsto complete, depending on complexity. To stop relapse of teeth after the fixed appliance/retainer is removed, permanent retention is essential in the form of a cemented wire (out of sight) and clear retainers must be worn at night.